Updated It's something we all do when we get home: rummage around in your pockets or bag, find your keys, identify the one you want and then stick it in your front door to gain access. If you are one of the roughly 28 per cent of households that have a security system, you then need to go punch in a code to turn the alarm off. It's something we do so often it becomes instinctual. Which is what makes all that much stranger when you find yourself no longer doing it. Nest is still best known for its smart thermostat but faced with growing competition and pressure to expand its product line, back in September it announced it was going to expand into security products: a doorbell, alarm system and a smart lock. The alarm system came out almost immediately but it wasn't until last month that the doorbell – called the Nest Hello – and the door lock – called the, um, "Nest x Yale Lock" entered the market. We have been testing them both for a couple of weeks, both by themselves and in conjunction with other Nest products – including its security system and smart camera. But we're going to focus on the lock right now because it seems the most significant. And the reason for that is quite simple: a few days ago, this reviewer took his front door key off the bunch of keys that reside in the jeans pocket. It was more of a psychological test than anything else: the key is useless because the Nest+Yale lock doesn't have a key slot, just a keypad. Currently, there is no other way to get into our house than through this lock (well, apart from breaking or jamming open a window). While the front-door key remained on the keyset though somehow, irrationally, that fact wasn't fully registering. The key did not go in the bin, and nor has the previous door lock (which cost far too much money when we first bought the house and decided to change everything out). But if you had asked before testing the Nest+Yale lock whether it was likely to remain, the answer would have been almost certainly not. Now it is possible that the old lock will get put away. The act of taking off the old front key immediately led to a number of thought processes and actions. For one, I now know how I would break into my own house if the lock failed. And that led to a re-evaluation of general house security. Soon after, I bought and installed a box strike plate – which is a heavy-duty version of the metal plate that your deadbolt slides into. It cost less than $7 and required a bit of DIY but it is infinitely more secure than the thin metal plate that comes as standard with most door locks – and which has been on my front door for years. That default plate typically can't take more than a few well-placed kicks before it fails. To Nest's credit, it does include two sets of screws for that plate: normal sized and long. The long screws provide significantly better security. But a box strike plate – which takes four screws and has a solid metal recessed part for the deadlock is what everyone should really install. The question then turns to: how secure is this electronic lock? The biggest failing in any door lock is two-fold. First, the ability for it to be kicked in – the strike plate part – and second, the ability to pick it, or drill it. The best locks tend to have more complicated locking mechanisms and use brass rather than steel for this reason. Even locks that are good at defending against kicks and picking will often fall down on drilling – because it costs more to use brass. 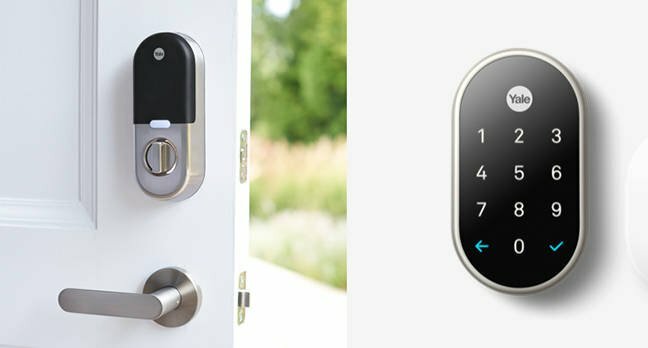 With the Nest+Yale lock, drilling is a more complicated affair because – unlike most smart locks that have both a keypad and a key lock – it only has a keypad. It's not entirely clear where to drill. In this sense, the lock is more secure than a normal lock. It's going to take a pro to get past it. Which then leads to the other type of security that normal, non-smart locks won't have: electronic. The Nest+Yale lock uses Google's Thread IoT protocol to communicate with its Connect bridge – or its Secure home station if you have that. This is a smart move as it puts a buffer between the lock and the internet. It's going to make hacking the door to open a much harder affair. It also means that it's not your phone directly opening the lock – like a lot of other smart locks do by using, typically, Bluetooth. Instead you are sending a command through to a different system which then talks to the lock. If, for whatever reason, this system breaks down – like your Wi-Fi going out – then you have the codes that you punch into the lock itself to open up. And that is where the convenience of the system begins. You can create new codes for specific people that expire or work on a schedule so you can allow others to access your home. It's not something you are likely to use very often – unless you're a serial Airbnb renter – but it is good to have. No need to get someone to come to you to get a physical key. You can simply set up and text them a code – six digits by default. If you have, say, a cleaner that comes on Monday mornings, you can set the code to only work between 9am and 11am, for example. It's from here that the conveniences start stacking up. For one, the lock will work with the Nest secure alarm system, so you can set it up to turn off the alarm system automatically when you unlock the door. That saves on one more step when getting home. You can also use the Nest app on your smart phone to unlock it. Having got into the habit of physically punching in a code, this reviewer decided that while walking toward the door, I would use the app instead. Pull out the phone, open the Nest app, tap the Lock icon, then hold down the big button in the middle for just over a second and the lock responds. It was fast, and weirdly convenient, except when the app took a while to load – but that's more to do with Apple's bloated iOS software and an old iPhone 6. This is really useful in a number of scenarios: carrying shopping and dealing with kids to name but two. We all tend to have our phones within easy reach – now you can use it to open your door while walking toward it. There are other advantages: you can see when your door is locked or unlocked – and by who (assuming you give people different codes). You can set up alerts if you want to be informed every time. You can set it to automatically close after a set amount of time (from seconds to minutes) – no more worrying if you locked the door in the morning while rushing out. And in the same way you don’t need a key to unlock it, you don't need a key to lock it either. You can either press the Yale button at the top, or leave it to lock itself. If, for whatever reason, it doesn't lock, it lets you know immediately with big yellow warnings on your phone and an LED on the lock. What if you're inside the house and don't want anyone with an access code to come in? You can set a privacy setting either on the lock itself by pressing a physical button for two seconds, or on your phone. And then comes the additional convenience if you use other Nest, or Nest-compatible products. One day, I went full Nest – the Nest lock, alarm, thermostat and camera – plugging them all in, getting them to talk to one another (which took just a few taps) and then leaving the house to test them remotely. All working now says biz. No, no, no, no, say customers, it is NOT!